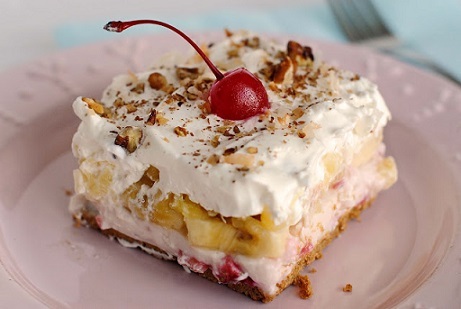 This Banana Split Cake is an ideal dessert when you have family coming to share a meal. 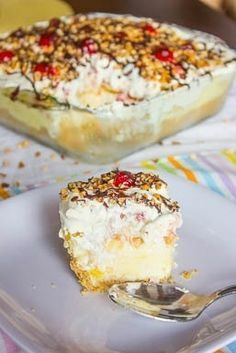 It combines the taste of bananas, pineapple pieces, vanilla pudding, cream cheese and Hersey's chocolate syrup and chopped nuts to make a simple but appreciated cake. 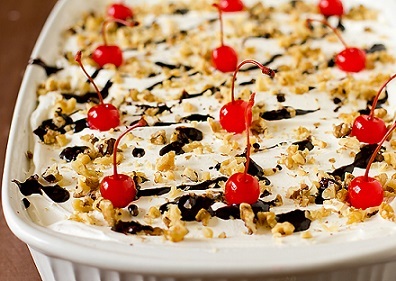 Everyone seems to like the tastes that make up a traditional banana split. There actually are a number of dessert recipes for this particular cake but this is one that a lot of the restaurant guests enjoy. Preparation time: 20 minutes + 25 minutes for baking. Serves 12-16. Don't forget to check out all the dessert recipes on the website. And thank you for visiting and your interest in real restaurant recipes! You might also like to visit the cook's resource page for information about cookware, bakeware, small kitchen appliances and food. You can cook with confidence and style! Enjoy your dessert and the company of those you share it with! Did you know? One of the first shipments of bananas to reach the colonies was in 1690 at Salem, Mass. They tried boiling them with pork. It took nearly 200 years after that culinary disaster for bananas to catch on with North Americans.